The period between the two world wars is often referred to as The Machine Age. Significant improvements in industrial design and technology occurred and this led to the mass-production of a variety of consumer products. The growth of industry led to a boom in the economy and it was in this time of abundance that Art Deco Style emerged on the scene. As the economy flourished, so did the luxury goods market. In poor economic times, people make do with basic necessities, and in prosperous times, the pendulum shifts back to non-essential spending. And it was back to the non-essentials during the days of Deco. Expensive jewelry, exotic vacations, glamorous mansions, roaring parties and flashy cars were the consumerist trends of the era. And another interesting lifestyle change occurred - people began attending the cinema again! This in turn led to the classic, all-time favourite past-time of the masses - obsessing over movie stars and their wardrobes. As money was no object for the rich and famous, the styles spotted on the red carpet oozed luxury and glamour. Sparkly starlets in minks and elegant floor-length silk gowns slipped out of white limousines, setting the fashion trends of the 1920's and 1930's high-society. 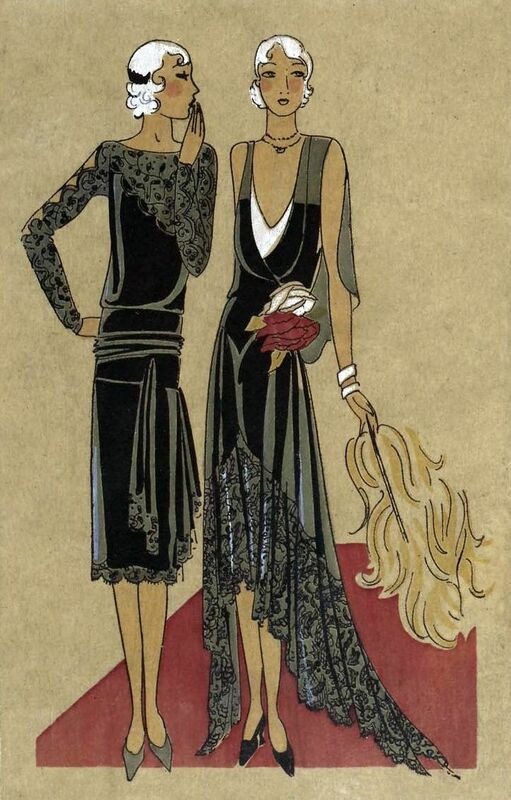 Read PART 1 and PART 3 of the Art Deco Fashion History Series.